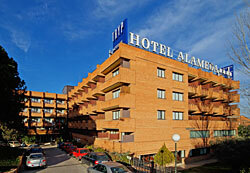 Tryp Alameda Airport Hotel near Madrid Airport, Spain. This first class hotel is ideally situated, near the airport, for visitors to the area. 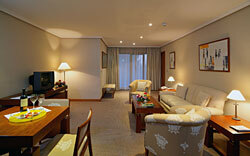 It has a welcoming atmosphere that emphasizes friendly and hospitable service. The spacious guest rooms are soundproofed and equipped with satellite TV, phone, radio and temperature control. Hotel facilities include two restaurants, cafe, bar, cocktail lounge, gym, squash courts, 24-hour room service, and conference facilities for up to 300 people. Also available is a free 24-hour bus to the airport and exhibition centre. All of the guest rooms are comfortable and nicely equipped to give a feeling of being home while away from home. The hotel also has a variety of facilities and services that are sure to meet the needs of both business and leisure travellers. 148 rooms totally refurbished with bathrooom and hairdryer, satellite TV, high speed internet access in rooms and wireless internet access in common areas, safe, electronic door lock and room service from 7am to 2am. High speed internet access in rooms. Wireless internet acces in common areas. Free 24 hour airport shuttle 24 hours (on request). Free transfers to the trade fair and exhibition center during events (on request). Exterior parking free of charge. Location: Hotel Tryp Alameda Aeropuerto is located in a residential area close to the International Airport Madrid Barajas, Juan Carlos I trade Fair and exhibition center, very near the Olivar Hinojosa golf course, and perfectly connected with the city centre by subway and bus. Take the M-30 and M-40 direction to Airport Madrid Barajas. Take the exit Avenida Logroño, turn direction Madrid Barajas village and you will find the hotel at 50 metres on your right. Metro: Barajas station (line 8) and buses (105 and 115). For transport to your hotel check out the AeroCity Airport shuttle or the AresMobile chauffeur services. And perhaps you need to rent a mobile phone while in Spain?